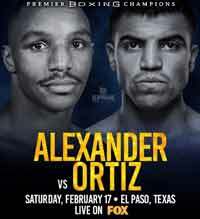 Review by AllTheBestFights.com: 2018-02-17, close fight but not so exciting: Devon Alexander vs Victor Ortiz gets two stars. The former world champion in two different weight classes Devon Alexander entered this fight with a professional boxing record of 27-4-0 (14 knockouts) and he is ranked as the No.33 welterweight in the world. He suffered two consecutive losses between 2014 and 2015, against Amir Khan (Amir Khan vs Devon Alexander) and Aaron Martinez (Alexander vs Martinez) but he came back to win in 2017 defeating Walter Castillo (Devon Alexander vs Walter Castillo). His opponent, the former Wbc Ww champion Victor Ortiz, has an official record of 32-6-2 (25 KOs=78%) and he entered as the No.66 in the same weight class. He was defeated by Andre Berto in 2016 (Berto vs Ortiz 2) but then he beat Saul Corral in 2017 (Victor Ortiz vs Saul Corral). Alexander vs Ortiz is the main event of the evening. Watch the video and rate this fight!